These didn’t start out as Birthday Muffins. Yesterday morning, when I found myself staring at a buttload of fast-ripening bananas, getting hungry for something mildly sweet and breakfasty, I decided to bake. Since I made my standard Banana-Chocolate-Pecan Bread not too long ago, I wanted to try something new. Out came the baking cookbooks. 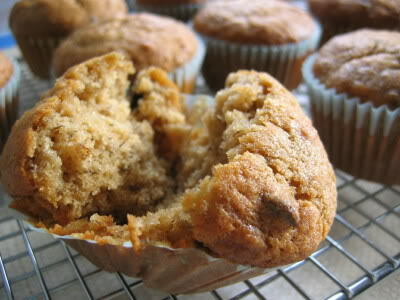 Most of the muffin recipes called for softened butter or sour cream, or both, and I had neither. In Moosewood Restaurant Book of Desserts, inspiration for my Pistachio-Apple Cupcakes, I found exactly what I was looking for: a truly spur-of-the-moment muffin recipe, calling for vegetable oil and other standard pantry items. It also gave me the chance to use my new sifter, a Hanukkah gift I forgot to mention the other day. I tweaked the recipe a little and baked them, and they were good. Almost too sweet, though, and my bananas were not extremely ripe—you may want to reduce the brown sugar a bit if yours are. So why are they Birthday Muffins? 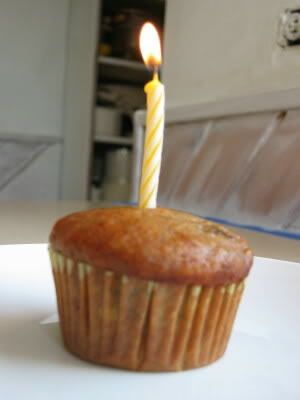 Well, because today is my birthday, and last night at midnight S woke me up (I’ve been turning in early lately, and he’s a bit of a night owl) with a present and a birthday-candled muffin. I made my wish and blew it out, and let S eat the muffin since I wasn’t exactly hungry. We stayed up to watch a bit of Heaven Can Wait—one of S’s favorites, which I’ve never seen—and I drifted back to sleep around 1AM, thinking about how lucky I am. Preheat oven to 350. 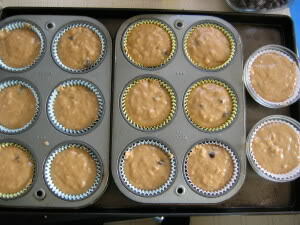 Oil or spray muffin tins, or use paper liners. In a large bowl, with an electric mixer or by hand, beat the oil, sugar, egg whites, and mashed bananas until well blended. Sift the flour, baking powder, baking soda, and salt into the bowl. 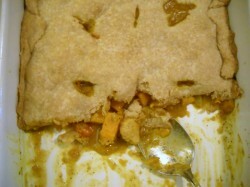 Fold the dry ingredients into the wet with quick strokes—be careful not to overmix. 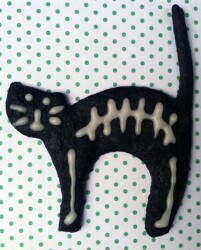 Fold in the vanilla and the chocolate chips. Spoon the batter into the prepared muffin tin and bake for 20 minutes, or until a knife inserted in the center of a muffin comes out clean [it took 26 minutes for mine]. 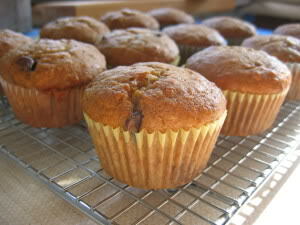 Turn the muffins out of the tin and cool on a rack. Psst! Want to give me a little birthday gift? Vote for Words to Eat By in the Best New Blog category at the Food Blog Awards!